A superb large area/boat polishing machine that's nicely balanced, light and and very comfortable to use. Model no. is Sealey ER230P. The action is extremely efficient - the 250mm diameter pad does 3000 oscillations per minute (no load speed) - equivalent to an extremely large bionic hand! 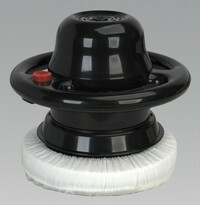 Use the smooth cotton bonnet for applying wax, and the synthetic lambswool for buffing, compounding and polishing. Supplied with two bonnets, one cotton, one synthetic lambswool. The machine we currently supply has a a black casing with red power button. Additional bonnets are included in a pack containing one cotton and one synthetic lambswool. The lambswool is ideal for final buffing. "Just a note to say many thanks for impressive speed with which my Optimate Charger Order arrived...ordered on net Wednesday pm, arrived Friday am....very slick and grateful thanks !"